The Gay Gamer: I spent my holiday weekend playing Cladun: This is an RPG, how'd you spend yours? I spent my holiday weekend playing Cladun: This is an RPG, how'd you spend yours? Still, that was more than enough time for me to come to the conclusion that this is a great little dungeon crawler. Although I wasn't initially too keen on its mix-and-match graphics (the character sprites have a chunky, 8-bit look to them while the backgrounds are more lush, like something you'd see in a 16-bit game), they've since grown on me. The gameplay, which seemed bewilderingly and harrowingly complex at the beginning, has similarly wormed its way into my heart. Anyway, that's how I spent my holiday weekend. How did all of you spend yours? Did you play any video games? If so, which ones? If not, how did you spend your time? I think Clandun really looks like a cool game. I'd heard the name before but actually never started looking it until right now. Hopefully I can get my hands on it soon. I barely played a thing over the weekend... Was too busy fussing around with Netflix, haha. Hey there, Marcus! Thanks for the well wishes :) It's kind of amazing we've been married for nearly seven years already. 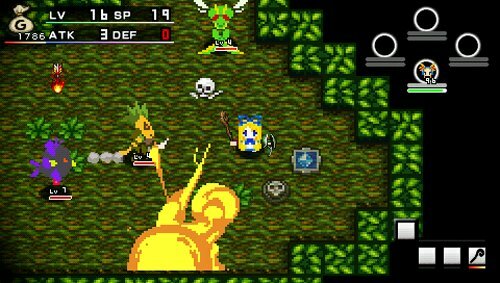 As for Cladun: If you like ARPGs (like Ys and Zelda) and roguelikes, you should love this game. I don't know what it costs in your neck of the woods (you're in the UK, right? ), but in North America it's just $19.99. Oh, I forgot to address your last comment! Sounds like you watched some movies this weekend, eh? Which ones? Oh, congrats on the upcoming anniversary, indeed! I've known my fiancée for almost 10 years now, which is crazy to think about! In the good way, of course. I should pick Cladun up again, I really did have fun with what I played of it. Have you stuck with playing as the pre made characters, or have you made one of your own? I share your feelings about the mixed graphics, by the way. Took me a little while to get used to it. Funny you should mention Ys, as I picked up a copy of Ys 1&2 Chronicles and have been playing that recently! I've played both games before so it's nothing new, but I am enjoying the new soundtrack and classic gameplay all the same. Looks like an interesting game. Like the simple graphics. Thanks, Kamiwoo! David and I have been together for 10 years now, too -- or is it 11? Oh, he's going to kill me :P Anyway, when are you and your fiancee going to get married (if you don't mind me asking)? As for Cladun -- I've mainly stuck with the pre-made characters, although I have made one on my own. I quite like the pre-made ones, though, so I haven't been in any particular rush to make my own. So, Ys 1&2 Chronicles is good? I loved the TG16 version as a kid, although its bump-n-run gameplay no longer does it for me, if you get my drift. This updated version features more modern (Zelda-esque) gameplay, doesn't it? And yeah, I really like the premade characters so making my own wasn't that much of a priority. I did spend some time making my own, but I'm really kind of impatient with that sort of thing, so premade it is! I think Sunday was my personal favorite choice so far, though I am bummed the cat character isn't playable! This updated PSP version of Ys is basically the same as the TG16 one (forever my personal favorite), so it still has that bumping gameplay. You might be thinking of Ys III: Oath in Felghana, which was updated racially from its original version. That's definitely more on the Zelda side of things. I can totally understand the bump mechanics no longer doing it for you, and I was actually a bit disappointed they didn't add in a "push button to swing sword" mode myself at first... but ultimately I'm falling for it all over again. The updated Ys III might definitely be something you'd be into, though! Yay, congrats on your soon-to-be anniversary! Happy almost! That's super great! Cladun...WANT! This weekend I played a teensy bit of Zelda...and some Hot Shots Tennis!! I've played three matches (soon to be four or five), and I'm just now getting the hang of the controls. There seem to be unlockables...although I'm confused about the different umpires. What does that affect? Anything? Kamiwoo: Oh, I shouldn't have asked you that. You probably get asked all the time, don't you? As for setting a date, I say do it whenever the two of you feel like doing it! As for Cladun -- I lose my patience creating characters, too. I do like that they make it at least somewhat easy in this game to make them. You don't have to start from scratch, for instance, which really helps. Also, I like that you can change the hair/coloring on any of the pre-made characters, too. As for the game you played over the weekend -- I've read a lot about Atelier Rorona and definitely would check it out myself if I owned a PS3. Have you played any of the previous Atelier games? I want to do so at some point, but I'm not sure where to start! Thank you, too, Justin! Ah, so you've played some Hot Shots Tennis and you're liking it? That's great! So, does the PS2 version have a story mode or not? As for your question about the umpires -- as far as I'm aware, they don't affect anything. They just give you something different to look at and listen to. At least that's how they worked in the PSP version. Oh, no, I'm in the US just like you! :) $20 doesn't sound like much damage so that makes Cladun look like a nice investment. For movies, I watched Return of the Living Dead and something else that was a lot of fun. Really though, I just vegged out watching Pawn Stars and Teen Mom lol. Ditching cable is a great idea. That's what I did and Netflix fills the tv void wonderfully. Hulu is especially great for tv, of course, but Netflix has a fair amount of shows too. Then Hulu has a selection of films but Netflix's is pretty superior for that. Why did I think you were in the UK? I have no idea... Anyway, yes, $20 isn't bad for Cladun. $10 would be better, but it's hard to be picky at this point. We watched a few episodes of Pawn Stars this weekend -- in between eating, shopping and walking :) I liked it! Yeah, we'll see about getting rid of cable. I'm all for it, but the hubs seems a bit hesitant. Really, though, Hulu+ and Netflix combined about be about $18 -- compared to about $50 for cable. We should at least try it! There's a whole lot of [Blank] of the Dead films out there so at least you got to see one of the better ones :). Return is really goofy... sort of like an 80s take on the more modern zombie comedies. I suppose it depends what you two watch on cable. For example, I don't think there's much Food Network content on either service which makes me sad lol. However, for most tv series they're either already there or coming at some point! Hmmm, Return sounds interesting. That said, I prefer scary zombie flicks to comedic ones. What's your favorite scary/serious zombie film, BTW? There's not really a story mode, per se...there's a career mode. Nothing approaching a story...at least not yet. If it's unlockable, I haven't seen it. For serious zombie flicks, I definitely love Dawn of the Dead (both original and remake) as well as the Night of the Living Dead remake. It might be sacrilegious in the horror community to say I prefer the remake, but I do! Zombi 2 is also an excellent zombie film although it is inadvertently rather silly. Haha, yeah, there's definitely not much or any content for those channels available :(. I really hope that soon there will be, seeing as how popular Food Network and HGTV are. Hey, maybe I can watch them after we get a Netflix subscription!